Gas phase – Solid phase – Photoreactor To carry out experiments on phase transfer or reactive uptake of gasphase compounds on solid surfaces, a small horizontal bed plugged flow reactor, e.g., to asses the photocatalytic nitrogen oxides abatement under simulated atmospheric conditions (Mothes et al. 2018) was built at TROPOS. The body of the reactor consists of chemically inert polytetrafluoroethylene (PTFE). The rectangular reactor geometry with a volume of 2.4 × 10-4 m-3 allows the examination of planar test objects with a maximum dimension of 0.400 × 0.050 × 0.006 m. The reactor is air tight closed on top with a quartz glass plate and due to additional UV- lamps the flow reactor can also be operated as a photoreactor. The lamps used are installed in a light-tight cover encasing the entire reactor during an experiment. For varying the light intensity, the distance between the lamps and the reactor can be varied depending on the experimental approach. 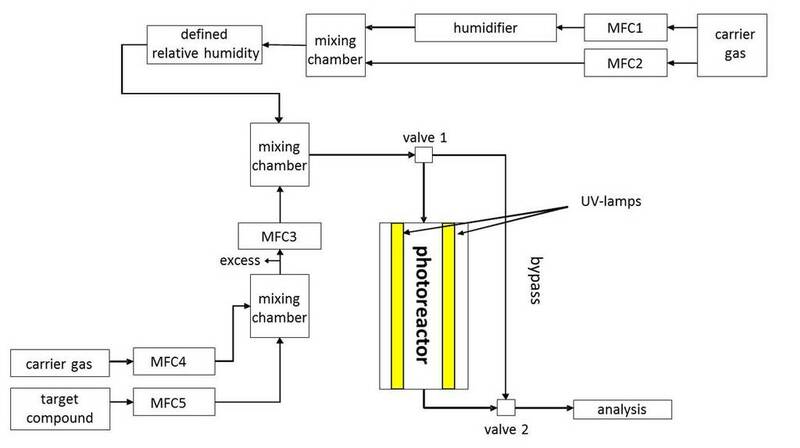 The general structure of the experimental flow reactor setup is shown in Figure 1 using the Gas phase – Solid phase- Photoreactor. 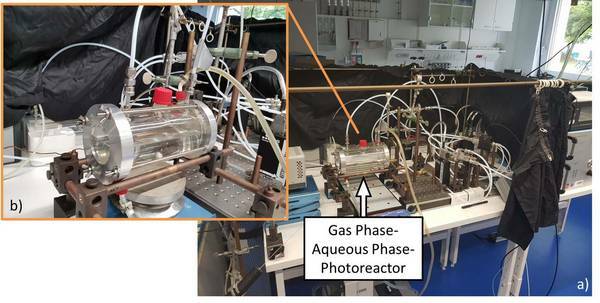 Gas phase – Aqueous phase – Photoreactor To carry out experiments on the phase transfer gas phase - aqueous phase or aqueous phase gas phase, a cylindrical photoreactor was built at TROPOS with an empty volume of 5.7×10-4 m3 (0.06 m × 0.2 m). This results in a maximum aqueous phase surface area of 1.2 × 10-2 m2 and a surface to volume ratio of 42.44 m-1 when half filled. Both experimental parameters can be varied based on the filling level. Depending on the experimental target, the aqueous phase is at rest or can be stirred during the experiment. The reactor is irradiated through a quartz glass window using an arc light source (e.g., xenon short arc lamp) in combination with various filtering systems (e.g., to simulate sunlight). The entire reactor is maintained at a constant temperature (e.g., 298K) using a thermostat. 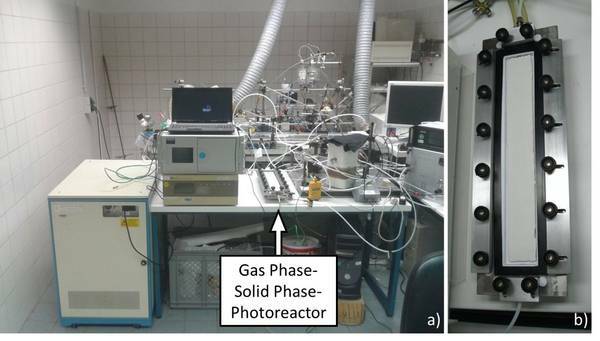 Figure 3 shows the gas phase - aqueous phase - photoreactor set up operating analogously to the gas phase - solid phase - photoreactor (see Figure 1). In addition to the sampling of the gas phase directly downstream of valve 2, the aqueous phase can be sampled and subsequently analyzed in parallel.